The ActiveCampus project aims to provide location-based services for educational networks and understand how such systems are used. activeclass enables collaboration between students and professors by serving as a visual moderator for classroom interaction. ActiveCampus Explorer uses a person's context, like location, to help engage them in campus life. A new UCSD ActiveCampus installation sponsored by Microsoft Research is now available to the public. If you're interested in how UCSD ActiveCampus works or want to build on it, head over to the UCSD ActiveCampus Public Server and try it out. 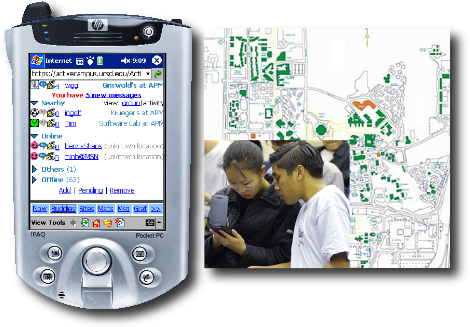 It has content for the Seattle, Washington area where UbiComp 2003 took place and ActiveCampus was last demo'd. Unlike the installation used for UCSD, the default visibility setting for users is a much more permissive 'visible to all', so be sure to change it if that concerns you. Also, communications are not encrypted over HTTPS. The ActiveCampus project is in high gear this quarter, and has quite a few new things to present! ActiveCampus now does ICQ, AIM, MSN, Yahoo, and Jabber instant messenging, so you can stay in touch with your friends from ActiveCampus on your PDA all over campus. You can also now use native instant messenging clients like Exodus to connect to ActiveCampus! There's even a SOAP layer so you can write your own location-aware applications against ActiveCampus. Want to hear more about the new stuff? Go check this out: New features in ActiveCampus. This project sponsored in part by Microsoft. This project supported by a major gift from the HP corporation. This project is partnered with the California Institute for Telecommunications and Information Technology.